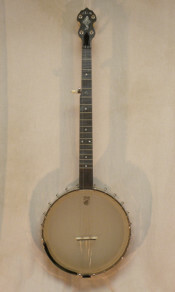 The Vega White Oak banjo features a natural white oak neck and pot, a Midnight Maple fingerboard, a truss rod, dual coordinator rods, and Deering Planetary tuners. We custom ordered this one with the larger 12" pot, a scoop, and a no knot tailpiece. This banjo sounds fantastic with a focused tone and remarkable note clarity for a banjo weighing in at only 6 pounds! Includes a deluxe Vega hard shell case and a custom setup from your friends at Steilberg String Instruments.